There's a new antibacterial in town and it's designed to be tough on grease and grime, while being easy on surfaces. 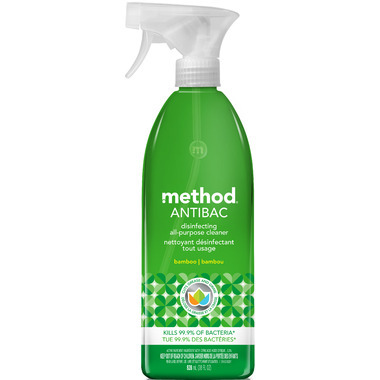 Ladies and gentleman, meet Methods Antibacterial All Purpose Cleaner! By killing 99.9% of germs while leaving behind a unique, fresh scent, this all purpose cleaner is ready for your toughest jobs. LOVE the smell of this product-and it cleans well too! This cleaner works well but I took away a star because it has a very strong scent which can be a bit much when used in a small space. Leaves a gritty film or powder on the counters. Need to wipe again with cloth and water... was hoping for a spray that only needed to be wiped in one pass. Cleans well and smells great without being full of chemicals - will definitely re-purchase when I run out! I adore method cleaners. This fragrance is my favourite . Antibacterial All Purpose Cleaner Bamboo. It cleans SO well and the lingering scent is that of just cleanness. Wow! I can't say enough amazing things about this product. It smells great, it cleans like a rock star, and best of all it's not loaded full of chemicals. I love, love, love this product and use it everywhere on everything! I feel it cleans very well, but the smell isn't very pleasant. At first it wasn't too bad, but it lingers for quite a while. Cleans well the bathtub and it smells good! Great cleaning product with a fresh, clean smell. Love that it is safe antibacterial product minus the nasty chemicals. Definitely will repurchase. The smell is strong and not a pleasant smell. It also lingers for a very long time. Not my favourite cleaning product. Powerful cleaning punch with a fresh scent! This product is great! The smell is not the greatest, but a good all natural, antibacterial cleaner. I would have given it 5 stars but because of the smell it only gets 4. I love that I can disinfect anything with this product and not worry about breathing in harsh chemicals. The smell is different, but I actually like it. I have a steam mop and will spray my floors with this and then steam mop over top. The scent is a little unusual but it works great and i use it in the bathroom to mask odors. I love that the scent isn't too too overbearing for a disinfectant. And the smell it has is quite pleasant. I used to be a bleach user until I met this guy. It smells incredible and I sleep well knowing it kills all the nasties! Not strongly scented, the smell is fantastic and does the job. Great all purpose cleaner. Works great. Smells good! Love the smell. I have found my new antibacterial cleaner. I really like this product. It smells great, cleans well, and I like that it contains safe ingredients but still kills bacteria! A definite win-win! Love it and will definitely buy more when it's finished. Subtle scent and powerful clean from a company that makes unique and effective products. Smells great, cleans well.....isn't that all we need? Smells great and works well - can be used for a number of things. I'd recommend it. I love this product! Really effective, cuts through dirt and grime. Used it to clean a house we just moved into that really needed a deep clean and I was actually shocked how well it worked. Loved the smell too, subtle and not overpowering. Buy it! I love most Method products, but I just can't deal with the smell of this one... It's horrible..
Great all purpose cleaner. I mainly use this to clean my kitchen counters and have not been disappointed. I personally love the smell of this. It's really fresh and light! The smell is horrible. I purchased this as an alternative to bleach sprays to clean my bathroom. I tried it Luton my already clean bathroom and the smell made the room smell like a mix between a musty old house and stale urine. Big waste of money. I'll have to give this product away and purchase Lysol or something. Bought this as an alternative to Method's Anti-Bacterial Spearmint spray - which makes me cough and wince more than actual bleach! So this is much easier, breathing-wise, and the scent is light and though I find it refreshing and lovely I can't say whether it would be universally appealing. I really like this cleaner. It does a great job and the smell isn't overwhelming. I LOVE the smell very fresh and clean and it cleans very well!! Highly recommend this natural cleaner. Love the smell, and the fact that it disinfects! The smell of this spray is a little strong at first but overall I like it. It cleans really well. Love the smell. I use it to disinfect my kitchen counters and bathroom surfaces. But as one reviewer mentioned, I wish this was streak free. I love the smell and way this cleans and disinfects. It does streak; however I am in the process of trying different cloths to see if that eliminates this issue. Definitely worth it over the harsh scents of other cleaners. I feel confident using this product in the presence of my children without worrying about the harsh chemicals they are ingesting. Love this product! Great smell and good Eco cleaner. I do like this product but am not a fan of the smell. It's nice, but just too strong. I have read comments about the smell of this product, but I did not find it to be bothersome at all. The smell itself reminds me of a clean smell. I found it a bit stronger than the pink grapefruit all purpose cleaner, but only by a small fraction. Absolutely love this product.Smell really good and does a great gob . Cleans amazingly, great smell although a wee bit powerful. It dies down quickly and leaves no streaks or germs. Yay!